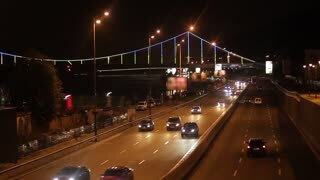 Slow motion footage of night traffic in a city center. Pedestrians cross the street on a crosswalk. Blurred image of people crossing the road. 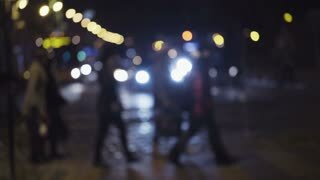 Slow motion blurred footage of people walk on the street of night city,pedestrians wait for walking on a crossroad. LJUBLJANA, SLOVENIA - MAY 2014: SLOW MOTION: People on Street. Slow motion Ljubljana city life from car side window. LJUBLJANA, SLOVENIA - MAY 2014: SLOW MOTION: People Waiting Bus in Front Of Casino. Slow motion Ljubljana city life from car side window. LJUBLJANA, SLOVENIA - MAY 2014: SLOW MOTION People Walking. Slow motion Ljubljana city life from car side window. LJUBLJANA, SLOVENIA - MAY 2014: SLOW MOTION: Bicycle Driving. Slow motion Ljubljana city life from car side window. LJUBLJANA, SLOVENIA - MAY 2014: People On Bus Stations Moving In Slow Motion. Slow motion Ljubljana city life from car side window. LJUBLJANA, SLOVENIA - MAY 2014: SLOW MOTION: People Going Shopping in Bauhaus. Slow motion Ljubljana city life from car side window. LJUBLJANA, SLOVENIA - MAY 2014: SLOW People on Sidewalk. Slow motion Ljubljana city life from car side window. LJUBLJANA, SLOVENIA - MAY 2014: Cars in Front of Long Apartment Blocks in Slow Motion. Slow motion Ljubljana city life from car side window. LJUBLJANA, SLOVENIA - MAY 2014: People Crossing Road In Slow Motion. Slow motion Ljubljana city life from car side window. Rush hour of the night city. Central highway of the old city. Evening city in motion. Night life. City in lights.